Each of the museums in question – the Keswick Museum, the Lakeland Motor Museum, the Ruskin Museum, the Museum of Lakeland Life, the Quaker Tapestry, Cumbria’s Museum of Military Life and The Armitt – additionally help prove John Ruskin’s view (preceding Kevin Bacon’s) that everything is connected. 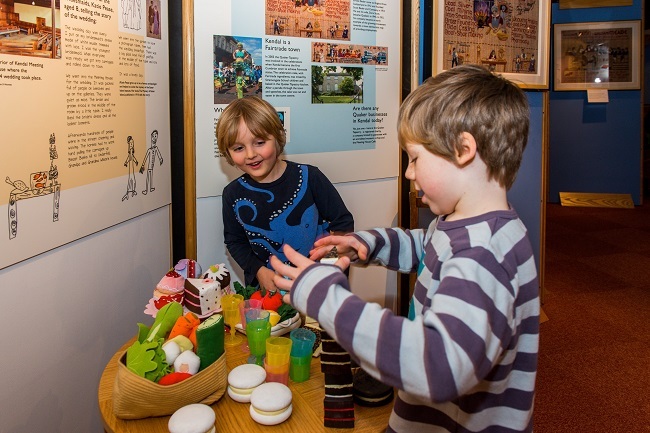 Exploring that hypothesis is another attraction for the museum goer, who can even do so with the assistance of a Heritage Past-Port, downloadable from the Cumbria’s Living Heritage website. Where else could group travellers do the extraordinary thing of walking the Lakeland Fells in just 30 seconds, not to mention flying over them in 10 minutes, other than at Keswick Museum? This is part of the thrill of an ‘Alfred Wainwright: A Love Letter to the Lakeland Fells’ exhibition, running to the end of 2016, exploring the world of the famous walker. Drawing with a dip pen and ink like Wainwright and being kitted out with replica Wainwright gear are just two must-do activities, if you can tear yourself away from musing over the historic Ice Age relic, the Vendace, and a 700-year-old cat, or stop playing three sets of musical stones. Speed links the Keswick Museum to the Lakeland Motor Museum, home to over 140 classic cars and motorbikes and over 30,000 exhibits in total, when you add in the huge collection of automobilia, pedal cars, cycles and displays relating to local history and industry. But the real speed merchant will inevitably head to the Campbell Bluebird Exhibition, dedicated to Sir Malcolm Campbell and his son Donald, heroes of all who love the rush that comes from putting the foot down on the accelerator, or seeing others do so. The exhibition contains full-sized replicas of the 1935 Bluebird Car, the 1939 Bluebird Boat K4 and the 1967 jet hydroplane, the Bluebird K7 and is a moving tribute to Donald, who broke eight absolute world land and water speed records before his ill-fated attempt on January 4, 1967. Donald Campbell connects the Lakeland Motor Museum to the Ruskin Museum in Coniston – described as “the most thought-provoking in the Lakes” by the Rough Guide to the Lakes and dubbed a ‘Cabinet of Curiosities’. One day, the museum will house the reconstructed Bluebird K7, raised from the bed of Coniston Water many years after Campbell’s death during his last world record attempt in 1967, but it already houses a prototype of the Bluebird JetStar ski boat, Donald Campbell’s pension plan and an extensive collection of Campbell items and memorabilia. But two other features of the Ruskin Museum link it, in turn, to the Museum of Lakeland Life in Kendal. These are a wonderful display of Ruskin lace and the sailing dinghy Mavis – the inspiration for the vessel ‘Amazon’ in Arthur Ransome’s ‘Swallows and Amazons’, in which fictional locations were based on places around Coniston. At the Museum of Lakeland Life, groups can muse over the recreated Arthur Ransome office, containing his typewriter, pipes, travel souvenirs, pen and ink illustrations of his works and his very own desk. In another display, they can see a Ruskin Lace Bag, the result of philanthropist and philosopher John Ruskin and his friend, Albert Fleming’s, decision to introduce lacework as a craft to provide employment for Lakeland women. Having equipped Fleming’s housekeeper, Marion Twelves, with a spinning wheel, a unique form of embellishment, using a Greek-inspired geometric style, was created and this became ‘Ruskin Lace’. They can muse over this when not walking down a recreated Victorian street, or finding out more about the history of farming, tanning and mining in the Lakes. Needlework links the Museum of Lakeland Life to Kendal attraction, the Quaker Tapestry. Here, some of the 77 stunning and moving tapestry panels, created in the narrative crewel embroidery style by 4000 men, women and children in 15 different countries, tell the story of Quakers and their role in the world. Themes traverse the industrial revolution, major scientific and medicinal developments, astronomy, the abolition of slavery, social reform and much more and some panels can be explored in more depth through ‘Stories Behind the Stitches’ interpretation. Quaker Tapestry panels exploring war and peace link the Quaker Tapestry to the Carlisle-based Cumbria’s Museum of Military Life. Here, groups can muse over 300 years of courage, loyalty and service and the history of the King’s Own Royal Border Regiment (and all the regiments from which it was historically formed). 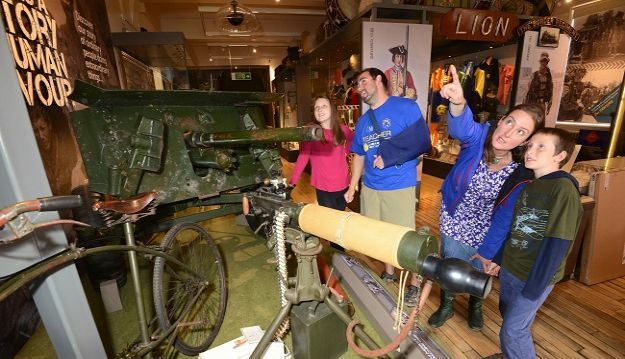 This year, Cumbria’s Museum of Military Life marks the 100th anniversary of the Battle of the Somme, in which seven battalions of the Border Regiment fought. The museum is taking visitors on a nostalgic and emotional journey, explaining the human loss on the Somme, whilst still continuing to tell the story of the Border Regiment in other periods of history and helping enquirers discover more about family members who were in service with the Border Regiment. As the Somme was taking place, the Armitt Museum in Ambleside was enjoying the first few years of its existence and the early support of Beatrix Potter, whose personal first editions of her “little books” are proudly displayed within it. Additionally, the Armitt has a large number of her exquisite botanical watercolours, which communicate lesser-known aspects of her life. The Armitt is also the place at which to muse over 30 stunning works by artist Kurt Schwitters – the largest public display of Schwitters’ work in Britain – and the museum to which to head if you are intrigued by the history behind the Ambleside Roman Fort, built in the Emperor Hadrian’s time. By hopping from museum to museum, groups can start to piece Lakeland, British, literary and speed record history together to make a more complete picture. Muse over what Cumbria’s Living Heritage has to offer your group, both on rainy days and on days on which you simply wish to breathe in history, and you will discover the amazing, the quirky and the not-to-be missed. More snippets to entice groups can be found in the Heritage Past-Port at www.cumbriaslivingheritage.co.uk where each of the 33 vibrant heritage attractions that make up Cumbria’s Living Heritage are detailed.